In vielen digitalen Spielen können Spieler ihre Gegenstände in einem Inventar ablegen. 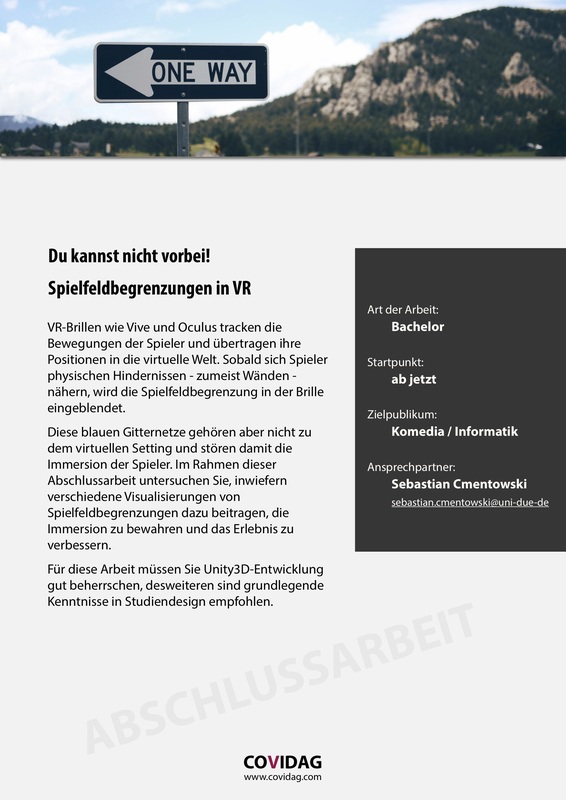 Für VR-Spiele funktionieren normale 2D-Oberflächen aber nicht und geeignete Alternativen wurden noch nicht erforscht. 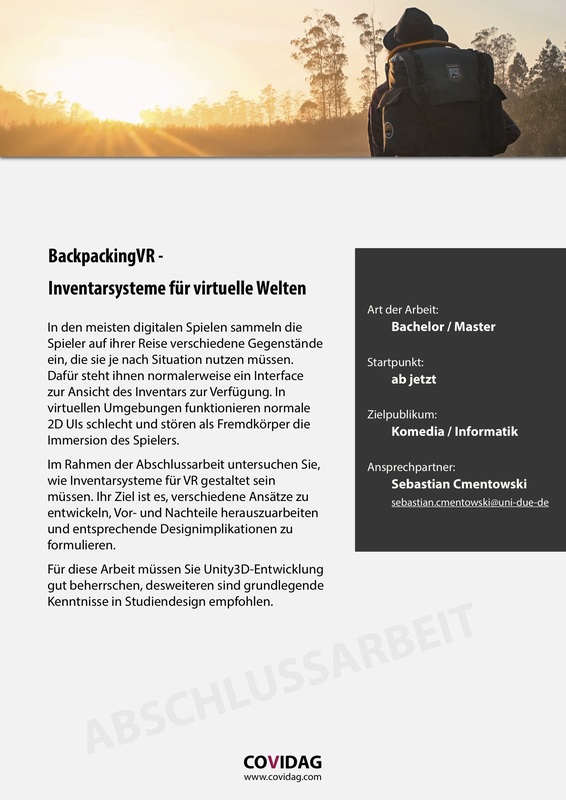 Im Rahmen dieser Arbeit entwickeln Sie geeignete Ansätze für VR-Inventarsysteme. Weitere Details finden Sie im Aushang. VR-Brillen warnen den Spieler vor Kollisionen mit realen Hindernissen. Dazu nutzen sie oft blaue Gitternetz-Wände, die aber das Spiel stören. In dieser Abschlussarbeit untersuchen Sie alternative Darstellungen dieser virtuellen Spielfeldbegrenzung. Weitere Details finden Sie im Aushang. 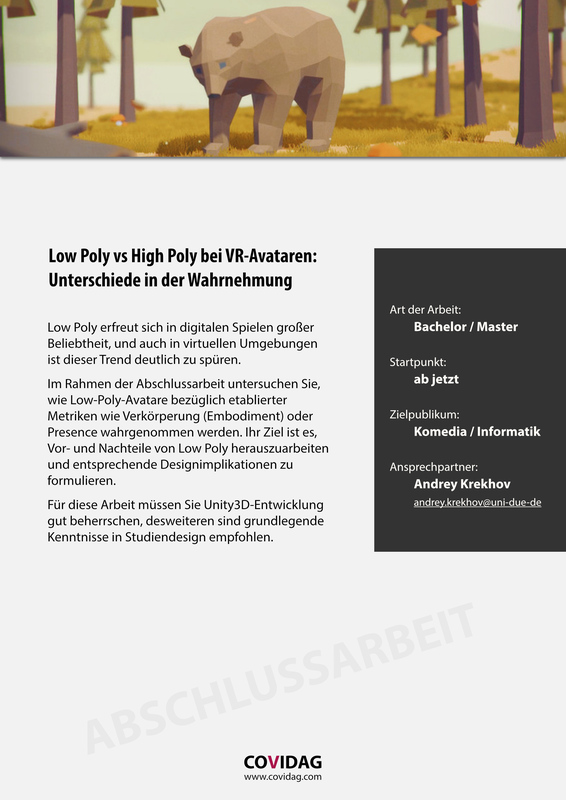 Im Rahmen der Abschlussarbeit untersuchen Sie, wie Low-Poly-Avatare bezüglich etablierter Metriken wie Verkörperung wahrgenommen werden. Weitere Details finden Sie im Aushang. 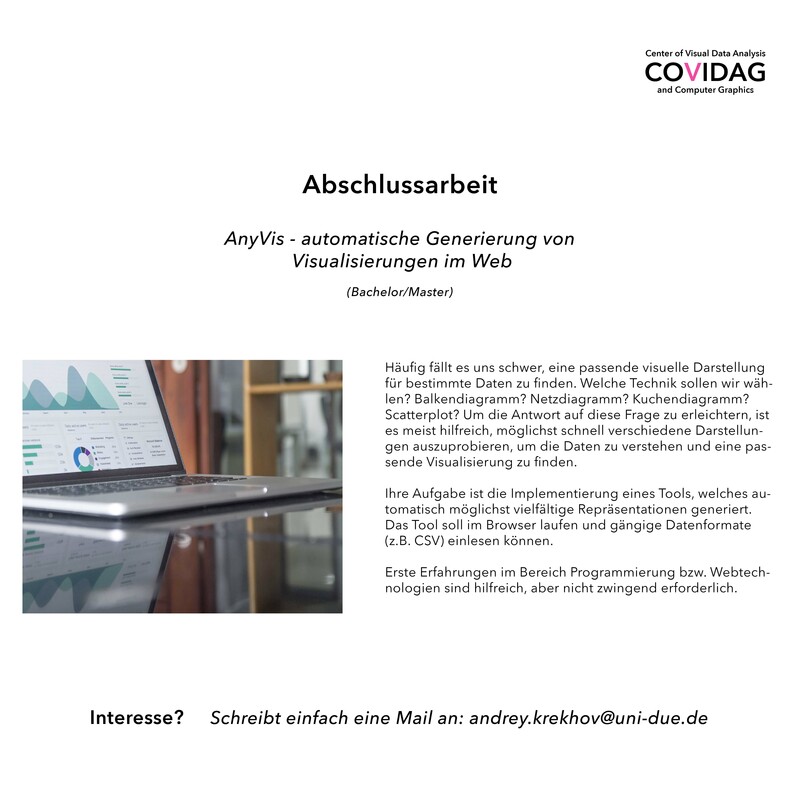 AnyVis hilft unerfahrenen Nutzern, Visualisierungen für die eigenen Daten zu erstellen. 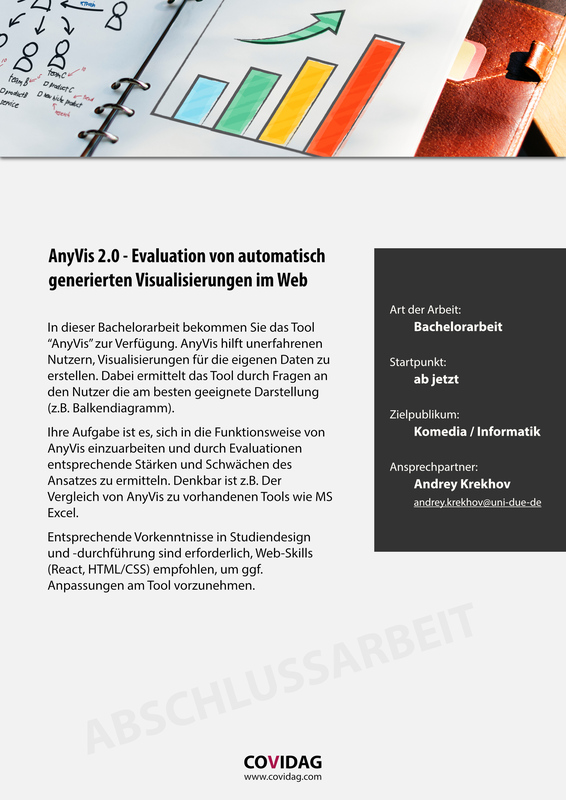 Ihre Aufgabe ist es, sich in die Funktionsweise einzuarbeiten und durch Evaluationen entsprechende Stärken und Schwächen des Ansatzes zu ermitteln. Weitere Details finden Sie im Aushang. (Thema bereits vergeben) Häufig fällt es uns schwer, eine passende visuelle Darstellung für bestimmte Daten zu finden. Meist ist es hilfreich, möglichst schnell verschiedene Darstellungen auszuprobieren, um die Daten zu verstehen und eine passende Visualisierung zu finden. Ihre Aufgabe ist die Implementierung eines Tools, welches automatisch möglichst vielfältige Repräsentationen generiert. Weitere Details finden Sie im Aushang. (Thema bereits vergeben) Starcraft 2, Overwatch, Dota, League of Legends - heutzutage ist e-Sports verbreiteter denn je. 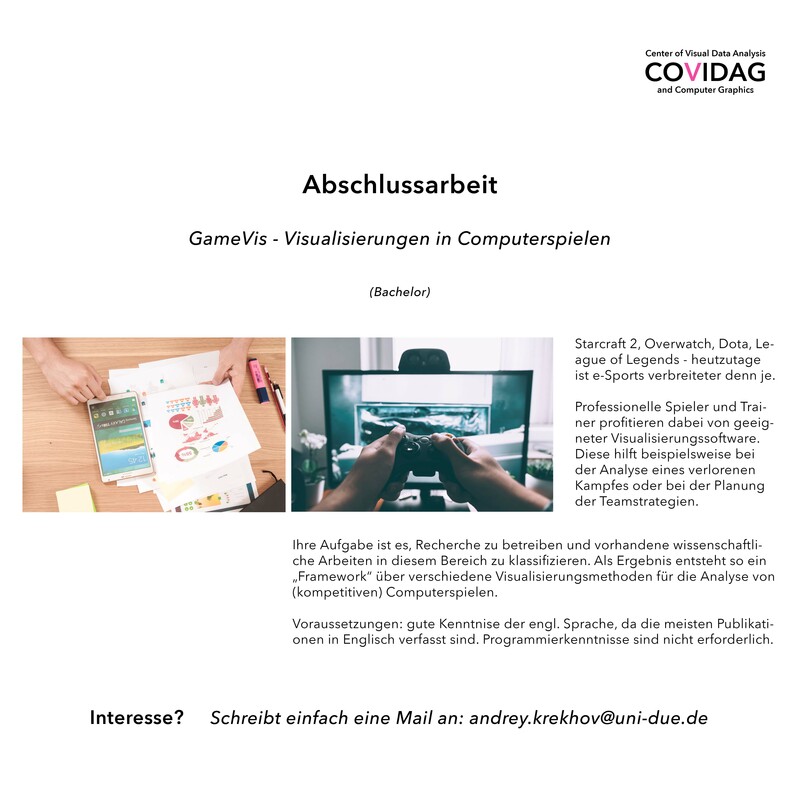 Professionelle Spieler und Trainer profitieren dabei von geeigneter Visualisierungssoftware. Diese hilft beispielsweise bei der Analyse eines verlorenen Kampfes oder bei der Planung der Teamstrategien. Ihre Aufgabe ist es, Recherche zu betreiben und vorhandene wissenschaftliche Arbeiten in diesem Bereich zu klassifizieren. Weitere Details finden Sie im Aushang. Recent advances in mobile GPU hardware are directly exposed to the developer. In this thesis potential performance impacts on established visualization algorithms should be explored and evaluated. Compatible hardware for development can be provided through the course of this work. We implemented an extensive user interaction logging system into our production mobile interactive volume rendering app, ImageVis3D Mobile, which is available for free on the AppStore. Users are able to optionally enable the logging system. This thesis consists of two main parts. First, a software tool needs to be created that aggregates, analyzes, and evaluates JSON-based log documents. Second, controlled task-based user studies should be performed in order to demonstrate the capabilities of the automated logging system and in order to evaluate and identify typical interaction patters with 3D visualization software. From a collaboration with the city of Saarlouis we have data on the evolution of the city center. Some of the buildings are covered in great detail while there is very little knowledge on others. In this thesis, existing techniques to visualize the evolution of a building are to be surveyed and improved. In particular the question of how to visualize uncertainties about the evolution is to be addressed. Im Rahmen der ausgeschriebenen Arbeit findet eine Auseinandersetzung mit dem Forschungsgebiet der Schlafanalyse basierend auf Smart Home-Komponenten statt. Der aktuelle Stand der Forschung wird ausgewertet und auf verwandte Arbeiten untersucht. Zusammen mit den Grundlagen wird ein Konzept zur Sammlung von relevanten Daten für die Schlafanalyse entwickelt. Nähere Infos finden Sie hier. The topic of this thesis is the API independent implementation of a hybrid GPU terrain rendering pipeline. The would consist of reading some publications and then implementing the software described within them. A key component of the resulting system is the API and output independence, i.e. the rendering calls and output routined need to be properly abstracted away to allow for an easy switch from one API to the other. In this thesis a mobile device (e.g iPad, iPhone, iPod) geometry viewer should be realized. This viewer will connect to a dataset server and stream a multires representation of the scene to the mobile device. The topic of this thesis is to conduct an evaluation of vastly different display environments, ranging from handhelds and PCs to large tiled display walls and their uses for scientific visualization. The task includes planning and carrying out of the evaluation in collaboration with members of our research team. In recent years there has been significant growth in the use of patient-specific models to predict the effects of neuromodulation therapies such as deep brain stimulation (DBS). However, translating these models from a research environment to the everyday clinical workflow has been a challenge, primarily due to the complexity of the models and the expertise required in specialized visualization software. In this thesis, an existing prototype for interactive visualization called ImageVis3D Mobile is to be extended. Trinity is a flexible visualization system developed by the HPC group. It consits of three components (hence the name Trinity). These components are I/O, processing, and frontend. One application for Trinity is volume rendering. For this application we would like you to develop a couple of special purpose I/O modules. These include procedual generated volumes, i.e., fractals, for large volume generation. The focus of this project is to further develop and evalutate existing and novel concepts for overview maps in very deeop zoom scenarios. The idea of an overview-map (or often called mini-map) is to give the user information about the context. When zooming into a large picture, the mini-map can display a small version of the entire picture with a little mrker (e.g. a rectangle) that indicates where in the full image the current view is located. While this concept works nicely for moderate zooms it fails as soon as the full image becomes so big that the during zoom-in the status rectagle becomes smaller than a single pixel. In this thesis the student should realize novel concepts to overcome this issue. As part of the work an evalutaion of multiple such concepts should be conducted. In this work, the concept of an overview-map (or often called mini-map) should be applied to volumetric datasets visualized within a spatial space (3D volumes). Overview+Detail is a UI concept where an overview and a detail view of an information space is displayed simultaneously. Overview-maps are frequently used for 2D datasets like pictures or maps, displaying the entire dataset with a little marker (e.g. a rectangle) that indicates where in the full dataset the current view is located. In 3D scenarios the position of the view-frustum is of interest, to keep track of his position within the overview-map an appropriate view-angle has to be found, as well as appearing occlusions need to be solved. In this thesis, the student should develop an appropriate model that addresses the mentioned problems. 3D printing has become a technology of significant media attention. But besides trying to print out working guns, what are the real-world useful application for this technology? Printing of custom models from volumetric data may be such a "killer app". In the medical sector for example, data taken from CT scans could be reproduced to replace damaged organs. Admittedly, there are still a number of issues that need to be overcome to make this a reality, most notably the development of appropriate materials that are bio-compatible. But even now the basic technology of printing custom models from scanned volumetric data has its applications, most notably in teaching and education. An interactive textbook or webpage would allow one to print course material in 3D for better spatial understanding. The focus of this projec is the integration of a software toolchain into our existing and in development volume rendering applications. To test the software our group will provide a Makerbot Replicator 2X 3D printer. In general, human beings are best at processing information visually, i.e., analysing images and moving pictures. But there are also a number of applications where auditory infomation exchange is much more efficient (e.g. in a navigation system in a car, where the visual attention should be focused on the traffic). The purpose of this thesis is, on the one hand, to identify classes of applications where visual and where auditory information exchange is more effective/feasible. On the other hand, it should be investigated how and where both senses can be utilized efficiently together. Typical scientific visualization applications require preprocessing of their input data before any image can be rendered. In times of exascale computing resources it's becoming even more important to preprocess large amounts of input data in parallel to shrink the delay of this step as much as possible. The goal of this project is to evaluate the achievable end-to-end performance on current shared and distributed memory architectures for the preprocessing of two and three dimensional raster datasets. Questions of interest would for example be the break-even point when it actually pays off to use multiple machines instead of just a single machine with a powerful graphics card because the data transfer from one machine to another needs also to be considered in this calculation. This projec's aim is to asses the difference in task perfomance when using monoscopic (one eyed) versus stereoscopic vision for standard visualization tasks.